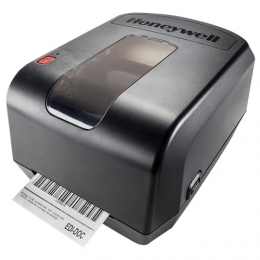 Honeywell PC42t PLUS makes label printing for beginners particularly attractive. Through intuitive operation and easy setup, in combination with an economical price, the desktop label printer is ideal for labeling the shipment of goods, retail and healthcare - wherever emphasis is placed on on-demand printing. The maximum label width of 110 mm a maximum print speed of 127 mm per second open a great number of application areas. The drivers are certified for Microsoft Windows. The user-friendly thermal transfer label printer is available with two different color ribbon holders: 12.7 mm (0.5'') and 25.4 mm (1'') for oversized ribbons (300 m). These are up to four times longer than ordinary color ribbons and reduce downtime due to media replacement and maintenance to a minimum. The proven printing mechanics print sharp results at 8 dots/mm (203 dpi). Integration into existing and new printing environments is particularly fast, thanks to numerous emulations like Direct Protocol (DP), ZSim (ZPL-II), ESim (EPL), especially since the printer languages are automatically identified and without any pre-settings. Proven interfaces (optional USB, RS232 or Ethernet) additionally simplify the connection of the PC42t.